4 More Things NBC Must Do To Save 'Meet The Press' NPR TV critic Eric Deggans offers four suggestions beyond replacing host David Gregory for revitalizing NBC's Sunday politics show, based on his own experience as a CNN guest host. 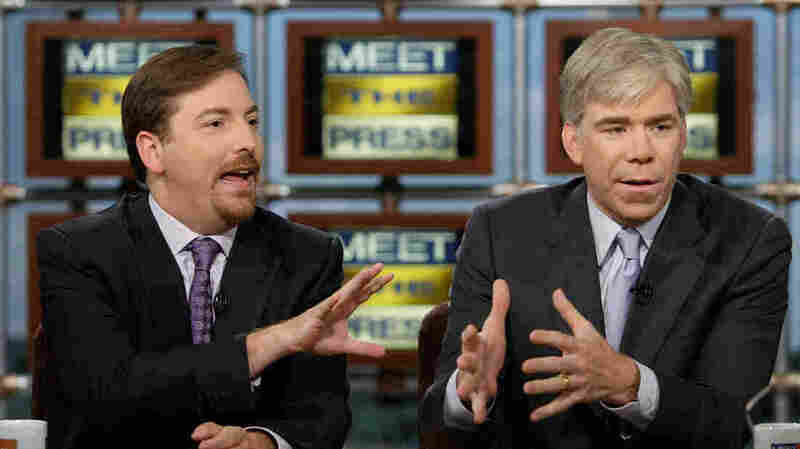 Chuck Todd (left) and David Gregory appear together on NBC's Meet the Press in 2008. In keeping with its recent tradition of drawn-out, publicly humiliating anchor switches, NBC has finally admitted it is replacing Meet the Press host David Gregory with the network's political director, Chuck Todd, on Sept. 7. The switch had been rumored for months, as it became increasingly obvious that the Gregory-led Meet the Press was sinking in the ratings and failing to set the news agenda in ways it did when the late Tim Russert was at the helm. Gregory took over the show in 2008 after Russert's sudden death. This change may seem like an esoteric matter, but Meet the Press is a broadcast institution. It is the longest continuously running TV series in American broadcast history, debuting in 1947, just two years after the end of World War II. And it's a demanding gig. I found out late last year how difficult such hosting jobs are, when I stepped in to guest-host CNN's Sunday morning media analysis show Reliable Sources on three occasions in the fall. I also learned a little bit about how these shows are put together, and the incredible impact even a guest host can have on what you see. On Meet the Press, Gregory has taken criticism for everything from displaying a high-capacity ammunition magazine during a discussion on gun control to questioning that seemed to accuse journalist Glenn Greenwald of breaking the law in his reporting on revelations by Edward Snowden. But my experience tells me replacing Gregory won't solve Meet the Press's problems alone. The show needs more change to stay relevant in today's news mix. Stop with the old boys (and girls) network. The same people keep appearing on Sunday talk shows offering the same opinions serving the same political agendas. I know the thinking; regular viewers have panel guests they like more than others, so you want to keep bringing the popular ones back. The result: Liberal media watchdog Media Matters found that more than 75 percent of guests on major Sunday politics shows in 2013 were male and 84 percent were white. But freshening the panel with new faces will bring new ideas, which makes the show more interesting, especially to casual viewers. I know such change is possible; in my last Reliable Sources appearance in November, half the guests were female and 30 percent were non-white. NBC missed a chance for diversity in hiring another white male as host (the show's first moderator, Martha Rountree, is also its only permanent female host, hired when the program was a radio show in 1945). Which makes it even more important to open up the show's Rolodex and use the guests to add variety. It's time to present a wider range of voices speaking on the week's events. And with a week to develop shows, there's time to ensure those voices are substantive and revealing, too. Get viral. Right now. One lesson Meet the Press could learn from network sibling The Tonight Show is the power of viral media. Creating moments that resonate online can turn the show's segments into social media calling cards, reaching out to an audience that rarely watches Sunday politics shows. It's also a chance to get the audience more involved in the discussions. Today's media consumers expect a two-way discussion that incorporates their input without looking gimmicky or forced. Makes news by challenging the Washington establishment more. Critics may not always agree, but Russert developed a reputation for cutting through talking points by showing what guests said in the past and how it might not line up with what they are saying in the present. Meet the Press could use more of that spirit; too many news shows play it safe with guests, especially sought-after names that can bring publicity. Too often, Gregory was criticized for moving in the opposite direction and asking questions steeped in establishment concerns. Find a new vision for the Sunday politics talk show. Before cable news channels centered so intently on politics, the Sunday shows were a good place to see newsmakers talk about the political issues of the week. But by the time Sunday rolls around nowadays, politicos have already made the rounds on CNN, Fox, MSNBC and possibly even The Daily Show or The Colbert Report. At Reliable Sources, it was a constant struggle to stay ahead of the news cycle, searching for new guests or different ideas that could add greater dimension to a story reported days ago. So what's the point of a Meet the Press in the modern media age? If Gregory had one major failing, it was his inability to solve this problem definitively. If Todd hopes to perform better as host, he'll need to have a better answer ready. Soon.